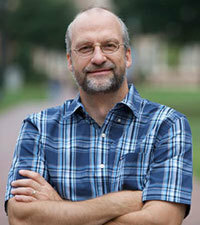 University of Notre Dame Professor Christian Smith has won the 2012 Distinguished Career Award from the Altruism, Morality and Social Solidarity section of the American Sociological Association (ASA). The accolade, presented at the ASA’s annual meeting in August, recognizes a senior scholar who has made significant contributions to the section’s areas of focus over an extended period of time. Smith says the acknowledgment is a true honor. “I think the award reflects a recognition among my colleagues that the various strands of my research and publishing on generosity, adolescents, theory of human personhood, religion and even political activism share a common theme that takes morality and self-giving seriously,” Smith says. He has won numerous awards for his research and publications. One of his most recent books, “What Is a Person? : Rethinking Humanity, Social Life, and the Moral Good From the Person Up,” was named one of Choice magazine’s Top 25 Academic Titles of 2011, won the 2010 Cheryl Frank Memorial Prize from the International Association for Critical Realism and received a 2010 PROSE Award honorable mention in the philosophy category at the American Publishers Awards for Professional and Scholarly Excellence. Currently, Smith is completing research for the Science of Generosity initiative, a project funded by a $5 million grant from the John Templeton Foundation that brings together the often disconnected and diverse approaches to generosity in order to research it in all its forms. He plans to write at least one book based on his findings. He is also completing the fourth and final wave of the National Study of Youth and Religion, a longitudinal panel study of teenagers and emerging adults. Research so far on this project has yielded multiple books, including “Souls in Transition: The Religious and Spiritual Lives of Emerging Adults” and “Soul Searching: The Religious and Spiritual Lives of American Teenagers.” In 2011, the Lilly Fellows Program in the Humanities and the Arts awarded “Souls in Transition” its Lilly Fellows Program Book Award. Originally published by Joanna Basile at al.nd.edu on July 23, 2012.